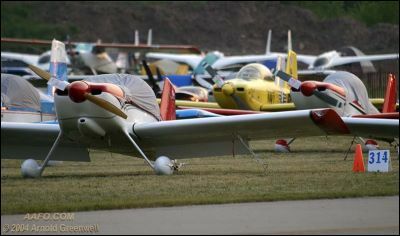 Each year, the Experimental Aircraft Association (EAA) holds their convention and fly-in, "AirVenture", at the EAA headquarters, located at Whittman Field, Oshkosh, Wisconsin. This event is known simply as Oshkosh to most aviation enthusiasts and has become one of the most popular aviation events in the world. Likely, it is the most popular and most attended event of any sort, anywhere! Your first trip to Oshkosh, be it by car, or by airplane can be a bit daunting, particularly by air but thats another story for another day. The event is simply so huge that whether you approach via land or air, the simple fact that approximately one tenth of EVERY airplane in the world is either already at or, heading to the same place you are headed makes it completely different than anything you will ever experience, anywhere. As a journalist, Ive attended the event twice and never even began to gain a grasp on just how to cover the event, let alone SEE the event. There is simply so much going on in so many places at the same time, each day for over a week, that just where to start becomes a day long decision! To say that we were overjoyed this year, when we were approached by Arnold Greenwell asking if we were interested in having him represent AAFO at the event might well be an understatement! just an empty head filled with dreams of flying among the clouds in one of the many amazing vehicles present at AirVenture. Our new man at Oshkosh, Arnold Greenwell didnt just walk in off the street either. First, he came with high recommendations from fellow photographer Robert Eng. Second, Arnold has been an official EAA photographer for several years at past AirVentures and he, likely WOULD know where to start.. where to find a middle and where to end! For more than a decade, Arnold was one of the official EAA convention photographers. He has been shooting at Oshkosh for years, originally starting out with the Southern Aviator. Concurrently, Arnold was a long time Sun'n Fun shooter and worked on the show paper staff for many years. In addition to the Southern Aviator and numerous EAA publications, calendars, and other materials, Arnold has also done assignments with AOPA PILOT and contributed to other aviation publications. He recently sold rights to one of his Wright Bros. Centennial photos to the Smithsonian. To pay the bills Arnold is a photographer and assoc. editor for an environmental health scientific journal at one of the National Institutes of Health. Arnold is also a private pilot and belong to the Wings of Carolina Flying Club in Sanford, NC. He shoots both digital and film with a preference to digital. Arnold is also a member of the International Society of Aviation Photographers.